This is your chance to try any of our oil and vinegar salad dressing combinations. For $3.00 we will give you a bowl of "greens" and an assortment of toppings and you can concoct a dressing of your choice from our vast array of oils and balsamics. Top your salad with your original dressing and you've just added to the greening of March, plus you will have an inexpensive, tasty lunch or snack to munch on. Come on in any day and time this month and enjoy a fresh, personalized salad of your making. Here's a cute, fun way for you to make some quick "Num-Nums" on a traditional Mexican treat theme. Using flour tortillas, frying them in Fused Whole Fruit Blood Orange Olive Oil or Fused Whole Fruit Lemon Olive Oil, then a quick dredge through sugar and cinnamon, and you've got yourself a nice morning, mid-afternoon, or evening treat with coffee or chocolate. Drop by the store on any of the dates listed above for an unusual treat. Best of all, it's FREE! 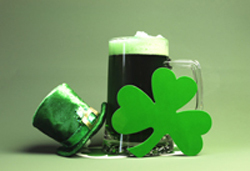 Only the Irish can celebrate in this unique fashion. The streets will be closed, so you can walk down the center of the road, street vendors will abound. There will be lots of beer, bands and a parade. Marisolio will be giving away their proverbial Lucky Irish Silver Dollar Pancakes from the booth located just in front of the store. Come taste our unique pancake toppings! This month we’re featuring several different sales (our regular sale items, a month-long sale of our favorite chocolate dessert pasta, and a special Presidents’ Weekend Sale. 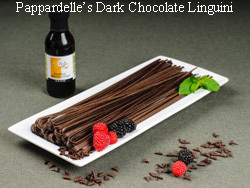 We have received a new shipment of Pappardelle’s Chocolate Linguini, just in time for Valentine’s Day! Cook it and then serve with fresh raspberries or strawberries and whipped cream with drizzled chocolate balsamic on top and you’ve got a wonderful Valentine’s gift for the special person in your life. Chocolate pasta? It’s delicious! The Dark Chocolate Linguini will be 15% off all month or until it is sold out. Stock up early! 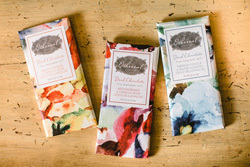 Come on in and buy your chocolate bars from Ethereal Confections. Not only are they a wonderful Valentine’s give, but they are made with our olive oils. During President’s Day weekend, February 16-18, everything in the store will be discounted 10%. For items already on sale, only one discount can apply. February is American Heart Month. Eat healthy! 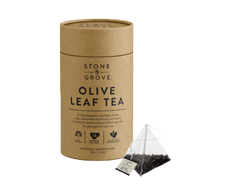 We will be receiving shipment of a brand new product, Olive Leaf Tea, the first week of December. Look for it in the store between the 5th and 7th of December. It will arrive just in time for you to give as another unique and healthy gift we try to feature here at Marisolio. The antioxidant properties found in olives are amazing, but in the leaves from the tree itself, they are more outstanding. After being collected, the leaves are cleaned, sanitized, and then are put through a Japanese steaming method to complete the process of making tea leaves. There are 16 bags in each canister. Our teas are produced from fresh leaves harvested in the Spring and Autumn from Boundary Bend’s olive groves in north west Victoria, Australia. Don’t forget the wonderful selection of other gift choices available at Marisolio such as pastas (many of them gluten-free), cosmetics, seasonings, dip mixes, bottled olives, rubs, mustards, hand-embroidered dish towels (great for the college students in their own apartments—they never have dish towels), tapenades, pour stops, etc. Let us help you with your gift shopping. Marisolio has made some great improvements to its website. It is now more mobile friendly, meaning it’s more readable on your tablets and phones. The shipping chargeglitches have been fixed and the recipe page can now accommodate more new recipes. When you purchase a product “on sale,” the original price will be shown crossed out next to the sale price, so you can be sure of your savings. And the monthly sale page will now be more colorful. Marisolio’s events, sales and classes (when they resume) can all be seen on the Events page, either as a list or as a calendar entry. We think it will helpful for you to have all activities listed in one place so you can refer to them anytime you want. Use the sign-up box on the Home Page to get our newsletters and also any announcements about special sales and free shipping events. Check our events page for more activities and special store hours during the holidays. November 3: Day of the Dead Celebration. Plan ahead! We expect a lot of people in Murphys over the Labor Day Weekend for one last holiday celebration before the school year really gets underway and summer vacations are over. We hope to see you at Marisolio this weekend. We have such a wonderful variety of oils, balsamics, gifts, pastas, and olive oil products. You’re sure to find something that suits your fancy. Sunday, September 16, Ironstone Winery, 6:30 pm: Boy George and Culture Club US tour hit Murphy’s with special guests The B-52s and Thompson Twins’ Tom Bailey. Get ready for some high energy and a very exciting night! Drought in Italy: For two years now, Italy has been suffering the effects of global warming which has greatly affected the Trebbiano grapes—precisely the ones used in the production of our balsamic condimentos. Production of the grapes is down which creates scarcity. Ergo, prices have had an upward spiral. Our balsamic condimentos come to us in 22 pound cubes. Depending on the size of the bottles filled, a cube holds enough to fill 13 to 50 bottles. While prices have been very stable and have not changed in years, our price from our distributor recently increased $7.00-9.00/cube. As a result, unfortunately, we have had to raise the prices of our balsamic condimentos. However, we have tried to keep the increase to a minimum. Thank you for your understanding. During the months of August and September, we have 4 all-new Cooking Classes we think you’ll find especially timely and interesting. See our EVENTS page for details. REMINDER: In hot weather, keep your olive oils in a cool, dark (not refrigerated) place, which will promote longer shelf life. The Murphys Mustard Company is a local business, making its own delicious types of mustards to the delight of all the locals and anyone else who appreciates great tasting mustards. Their Foothill's Fire Mustard uses Marisolio's Serrano Honey Vinegar as one of its ingredients. We've included two of their recipes in the recipe section, but check out their website for more of them at murphysmustard.com. Roy's Seasonings is a small company in Murphys featuring natural blends of various herbs and spices to enhance the foods of your choice. Their blends use little or no salt and have no artificial ingredients. With their seasonings you will get pure, bold taste with no fillers, no color enhancers. What sets Roy's blends apart is that he uses an Italian herb base. His Poco Picante, shown here, adds the zip to his Crispy Chicken Recipe featured in the recipe section. The Spice Tin is a most interesting store to visit on your next visit to downtown Murphys, The delicious smells of the spices can be detected in the air a block away. It has sooooo many fragrant and pungent olfactory delights awaiting you. Spices from all over the world can be found here, so there's no excuse for not finding your special, hard-to-find spice to perk up your next delicious recipe. Their website is thespicetin.com. Since we celebrate jumping frogs at our county fair, it's only right that we feature frogs on our list of "fare time" specialties. You can have them anytime at Hillbillies Restaurant located on Hwy. 4 at the turn-off entrance to Murphys, CA. They're delish! Check out their menu on Facebook. Scroll down and click on Hillbillies Favorites and you'll find the Frog Legs. Marisolio Tasting Bar, the sponsor of this newsletter, began with an olive orchard dream. After developing the 4000 tree ranch, learning how olive oil was made, producing four different varietals with her own label, owner Mary Lou Schuster decided it was time to market her oil along with other varietals and balsamic vinegars in a retail setting. The dream began in 2000 with 43 acres of bare land. Then 8+ years ago the retail store in Murphys, CA opened its doors. It now boasts an average of 33 olive oils, varietals and delicious infused varieties. An equal amount of balsamic condimentos, both dark and white, grace the shelves waiting for customers to taste their deliciousness. Take the virtual tour when you reach the website at marisolio.com. If you find yourself in Murphys this summer, please visit our local shops and let them know you heard about them from us. And if you aren't close enough to travel to our area, Murphys Mustard, Roy's Seasonings, The Spice Tin and Marisolio Tasting Bar all have an online presence and do online orders. New Oils now on the shelves: The Nocellara, which is on sale this month, is a coveted variety native to Sicily! It has a lovely, distinct fruity aroma and floral hints. Pungent and spicy with slight, fleeting bitterness. This oil has middle notes of creamy green almond, artichoke as well as confectionary notes. A perfect choice for those that crave a little bite and fruitiness in one. The Biancolilla, also from Sicily, has lingering pungency and very little bitterness. This creamy oil has vegetal notes of artichoke and savory of herbs. A complex example of this olive variety. Rubbing it In….In case you don’t have the time or inclination to make the rubs featured in this month’s recipes, we have lots of awesome already-prepared rubs for lamb, chicken, pork, beef and fish in our store. Just pop on in and make barbecuing a breeze. Don’t forget to check out our Google Business Tour page. If you’ve never been to Marisolio, this will give you a very clear picture of our beautiful store and all the things we have to offer our customers. If you should find yourself in our area during vacation time, please stop by. Be sure to look at our upcoming Cooking Classes by clicking on the Events Tab on our Home Page. We have 4 really interesting and varied courses lined up for you during May and June. If you’ve never been to one of our classes, this might be the time to give it a try. They always end up being a lot of fun. Bring your friends or come by yourself and meet some new people from the community. Hope to see you soon.